Journal Reference: Lareau N, Y Zhang, and S Klein. 2018. "Observed Boundary Layer Controls on Shallow Cumulus at the ARM Southern Great Plains Site." Journal of the Atmospheric Sciences, 75(7), 10.1175/JAS-D-17-0244.1. Fig. 1. Composite vertical velocity for shallow cumuli. Red colors indicate ascent, cool colors descent. The time and height are normalized by cloud duration and height. White dots indicate cloud base. Fig. 2 Relationships among convective inhibition (CIN), cloud base updrafts (Wcb), updraft fraction, and cloud liquid water path. Laser-based wind measurements yield new perspectives on currents of air ascending into clouds. These measurements reveal a relationship between the strength of updrafts and the stability of the air near cloud level that controls, in part, the fraction of the sky covered by fair-weather clouds. These observations will help refine the way clouds and updrafts are represented in earth system models. Doppler lidar-measured vertical velocities are used to study boundary-layer turbulence and cloud dynamics at the ARM Southern Great Plains (SGP) site. 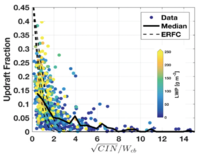 These data provide observational validation and constraints on convection theory, showing that shallow convection is reduced by convective inhibition (CIN) and increased by increases in the turbulent vertical velocity scale (Wcb). The links between boundary-layer updrafts and the development of shallow cumulus clouds are examined using a suite of remote and in situ sensors at ARM SGP. The goal of the work is to improve the representation of sub-cloud circulations and convective clouds in Earth system models. A key instrument in the study is a Doppler lidar, a laser-based device that measures vertical velocity at and below cloud base. The lidar data are drawn from a large sample of days with fair-weather clouds, yielding a detailed portrait of the sub-cloud circulations associated with individual clouds (Figure 1). Among the ~1800 clouds sampled, we show that most clouds (63%) are linked to coherent updrafts extending from the convective boundary layer and into the cloud base (Figure 1a), whereas the remainder lack updrafts and are characterized by sinking air at cloud base (Figure 1b). We also find that the cloud-base updraft strength varies as a function of updraft width, such that wide updrafts are stronger than narrow ones. These cloud-base updraft data are subsequently combined with other observations of the atmospheric stability in the cloud layer to formulate a cloud inhibition (CI) parameter, which describes the ease of triggering clouds. To be specific, the updraft fraction and cloud liquid water path (a proxy for cloud depth) are shown to vary inversely with CI parameter (Figure 2). 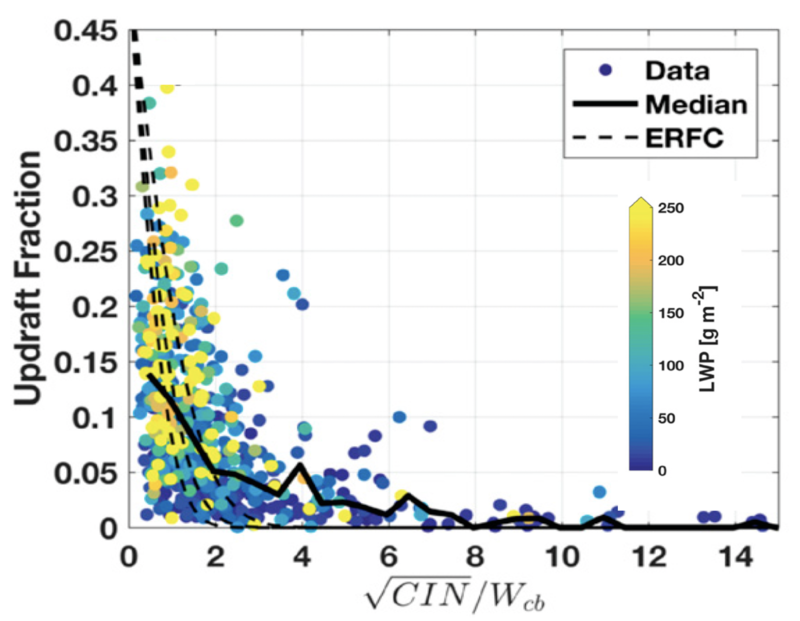 These data provide observational validation and constraints on convection theory, showing that shallow convection is reduced by convective inhibition (CIN) and increased by increases in the vertical velocity scale (Wcb).